You may or may not know this, but Stonyfield yogurt and ice cream is made from milk produced on Organic Valley farms. We often get asked why Organic Valley doesn’t make its own yogurt and that is the reason why. We are making it, just under a different label. The partnership came to being about a year ago and a half ago. Right now Stonyfield is Granting Farmer Wishes to six deserving Organic Valley farm families. Each of these families submitted a grant application to their operations. Their proposals had to show a positive environmental impact, innovation and the ability to sustain organic farming practices. Stonyfield is giving away $10,000 to the top applicant, two $7,500 awards and three $2,000 awards. The winners are chosen by YOU. You need to visit the Stonyfied Facebook page to cast your vote. Voting ends February 28, 2011. Tell your friends about the page too. The more votes the better!! All of us at Zweber Farms read many industry magazines, newspapers and publications. Some are dairy focused, some are organic focused and some are just general agriculture information. The other day when I pulled Progressive Dairyman out of our mailbox, I was shocked to see the words “consider grazing as a means to profitability” on the front cover. Don’t get me wrong, we enjoy reading the Progressive Dairyman. Their up to date coverage on industry issues and trends is very helpful. But when it came down to the articles on animal care or management, their focus really didn’t fit our operation. We are grazers and our needs and issues are very different than those who operate with barns. Not only was there one article about grazing, the entire issue was dedicated to the topic. When you read Editor Walt Cooley’s intro, he explains why. He had just visited New Zealand where grazing is a very popular and successful dairy business model. His visit reminded him of a time when his father explained to him “what works for me does not work for everyone else”. How refreshing. We have always thought of our farm as progressive, not regressive. Many naysayers of grazing and organic herds say we are just submitting to consumers’ fears and not taking advantage of the “latest” technology to be successful. “Why would we want to return to the 1950’s of farming?” they ask. That is far from the truth. In fact today’s grazing herds employ many new advances in technology. Advances in herd genetics, pasture management, manure application, and environmental practices. This is not unlike “conventional” herds. Our technology may not be the same but it is still progressive and always moving forward. Any farmer who makes proactive changes to their operation to keep it sustainable for future generations is progressive in my book. Grazing and organic dairying works for our animals, land and families. Does that mean that it is the only model? No way, and I know many “conventional” dairies that use very sound animal and environmental care. This is why it is so important for non-farmers to continue to ask the tough questions about where their food comes from. Having those conversations will continue to make us better food producers. If we are open to farmers producing food in ways that “work for them” then we need to be open to non-farmers who want a choice in how their food is produced. Whether you consider yourself “green”, a “foodie”, a “coupon clipper” or a “green, foodie who clips coupons” (like me), you should continue to have the choice to buy what fits your food philosophy. As the attitudes in food production mature, and become more welcoming of all, the variety of food choices will also grow. Thank you Progressive Dairyman for a great first issue of the year. Hopefully your example will encourage others in the industry to continue to encourage farmers to do what works for them. It seems that everyone loves a good conspiracy theory. Growing up I could be found glued to the television when Unsolved Mysteries was on. UFO’s, unsolved deaths, crop circles, I loved it all. I still find enjoyment in reading about conspiracies and mysteries, but for me, it is mostly just fun and all taken with a grain of salt. Recently, on Twitter I saw that a government “conspiracy” was being “revealed.” What caught my eye was that this conspiracy involved the National Organic Program. Apparently, Monsanto was in cahoots with the USDA and a product (Neotame, a sweetener) of one of their former affiliate companies was being allowed in organic products. Or at least this is how the conspiracy goes. With a quick Google search, you will see that this theory spread like wildfire around the internet and blog sphere. I do know that some non-organic products are allowed in organic production and processing, but the list is small (110 items) and usually the items are one compound items, like salt, natural minerals and yeast. So, being someone who doesn’t just take everything I read as fact, I did my own investigation. If you visit the USDA National Organic Program website you will see a link to the National List of Approved and Prohibited Substances. This link isn’t hidden, in fact it the top link on the page. You can view the list without a password or secret hand shake. What I found was that Neotame was not on the list. What does this mean? It means that Neotame is not allowed in 100% organic products. But that doesn’t mean if you buy an organic product that it might not be in there. Remember that organic products are broken into four categories: 100% organic, 95% organic, 70% organic and less that 70% organic ingredients. Review each categories requirements here: Labeling Packaged Products under that National Organic Standard. It is quite possible that Neotame could be found in products that are labeled “made with some organic.” If you don’t want Neotame, buy 100% organic products. Any FDA approved ingredient can be included in the last category. This isn’t a mystery, I believe the rule is clear. There you have it, mystery solved. What I don’t get, is that Neotame was approved by the FDA in 2002, why now for all the hubbub? There is a debate on whether Neotame should have ever been approved by the FDA, but that doesn’t jeopardize the integrity of the USDA Organic National Standard. If you ever have questions about organics, please do not hesitate to ask. I don’t know everything, but I am pretty good at directing people in the right direction. Giving To a Charity this Season? Support Agriculture! Our mailbox is always full these last couple days of December: Christmas cards, letters, store catalogs, flyers for holiday events, etc. But most notably are all the charitable donation requests. December is year end for many charitable organizations and it is also the last chance to give before the end of the tax year. As a former Executive Director of a non-profit organization, I cast a wary eye on many of these requests. If the organization cannot tell me where the money will be used, what percent goes to overhead or even their legal name or tax identification number, the envelope gets recycled without a second thought (that also goes for all those charitable phone calls I get). One “charity” that always gets my goat this time of year is the Human Society of the United States (HSUS). They send out these cute campaign brochures with sad puppies and kitties all over them. They talk about stopping factory farming and rescuing animals. But if you look closer, HSUS does not own or operate any animal shelters, nor do they spend a majority of their budget on animal rescue. In fact, they spend much of it on lobbying efforts, pension plans and more fundraising. So what is a charitable person suppose to do? First do your homework. If the charity is local, look them up on your state’s Secretary of State website. They should be registered as a 501c3 non-profit. Also, check out Charity Navigator to see how their money is spent. If you get a phone call from a charity that doesn’t let you talk over your donation with your spouse, hang up. Once I had a “Veterans” charity call me and they could not send to a website or other place for more information about them or did the caller know the tax ID number. They said that they were just a volunteer. Wrong answer. Good volunteers would know that info or could get a manager who does. Lastly, do not give out your credit card number out over the phone. Ask for a donation envelope or secure website to donate on. If you are interested in giving in ways to help agriculture this season, here are some of Zweber Farms favorites. MOSES: serves farmers striving to produce high-quality, healthful food using organic and sustainable techniques. MOSES has given many farmers like us the resources and the support to start and to continue farming organically. 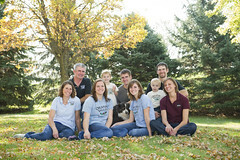 AgChat Foundation: Do you like how our farm “tells our story” and wish more farmers would do the same? AgChat Foundation was started to give producers and those in the agriculture industry the skills and resource to tell the story of food, fuel and fiber production. Tim serves on the advisory board. MN Agriculture in the Classroom: Do you wish more students had connections to where their food comes from? Support groups like Ag in the Classroom. Each state has one in some form or another. As the former executive director, I know for certain this organization makes our “A” list. Local Animal Shelter: Due to the millions being donated to HSUS in thoughts that people are helping shelters, local shelters are actually loosing out. If you want to support animal rescues, support your local shelter. Giving a charitable donation is a great gift for those “hard to buy for” types. Make sure to do your homework and support those causes that matter most to you.